“Limin’” is a colloquial Caribbean term for relaxing, taking a load off or hanging out. And that’s exactly what the owner of Callaloo Caribbean Kitchen on East Anaheim wants his customers to experience: a place where great food and relaxation meet in the middle of bustling Long Beach. A restaurant that whisks you away not only with the fast beat of Soca music tapping on eardrums, but by the aroma of rich flavors that excites the palate and makes the mouth water. Callaloo provides an introduction to Trinidadian and West Indian culture through the fusion of spices and textures unseen in other ethnic cuisine, creating a dining experience that will have you already planning your next trip and meal before the check is delivered. For owner Hamid Latiff, a native of Trinidad, vision and passion for this food stems from his West Indies/Southern Caribbean upbringing. As patrons order, Latiff shares his country’s culture, memories and history through the food. Latiff’s background for many years was in retail, but upon moving to the US six years ago, he knew it was time to venture out and bring the Caribbean to Long Beach, where he and his wife, a Cal State University Long Beach graduate, have settled. Latiff opened Callaloo only three months ago and has already received gainful praise from the Long Beach and SoCal Caribbean community. “It took me two years to find the right spot,” Latiff said. It was important for Calalloo’s location to be off the main Downtown grid and not to battle restaurant over-saturation. Callaloo stands alone as the only “Trini” restaurant in the area and one of only two in greater Los Angeles. Callaloo provides guests a menu with Trini basics and Latiff purposely brought in chefs with Caribbean roots to share in his vision. Some of the vegetables are even imported through Miami so the dishes can be made traditionally. The name Callaloo is derived from a traditional spinach-based stew found almost everywhere in Trinidad and Tobago. The soup contains an unlikely combination of tropical, European and Latin American ingredients and serves as an edible metaphor for the cultural diversity present in Latiff’s native land. But the number-one traditional Trini dish is the Roti. 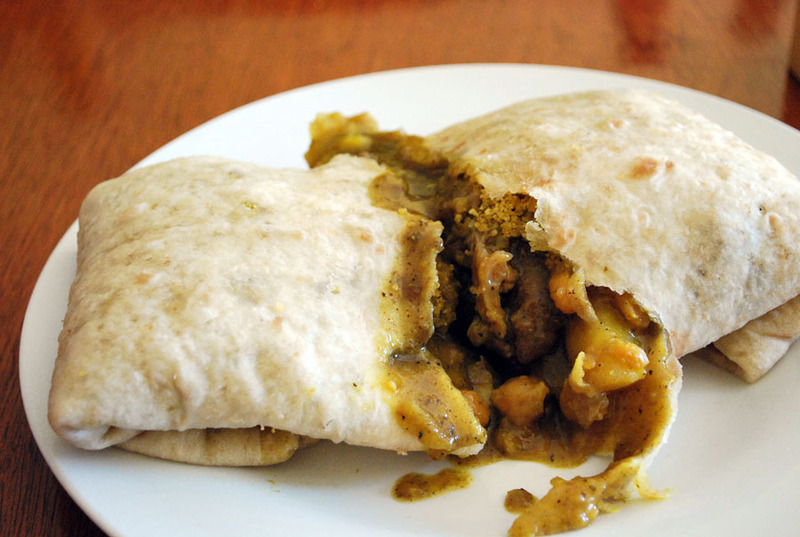 The Dhalpuri Roti with chicken is also indicative of the fusion that makes up Trinidad-Tobago’s rich culture, pulling from Indian, Asian and Latin-American influences. The whole of this Roti looks like a burrito, but don’t judge it until you’ve bitten into it. The wrap is comprised of dough infused with chickpeas. You’ll notice garbanzo beans, called channa, also the potatoes (or aloo), mixed in with vegetables, all spiced by yellow curry that coats your palate. All of this is met with sizable chunks of chicken, succulent and fortified with yellow curry as well. 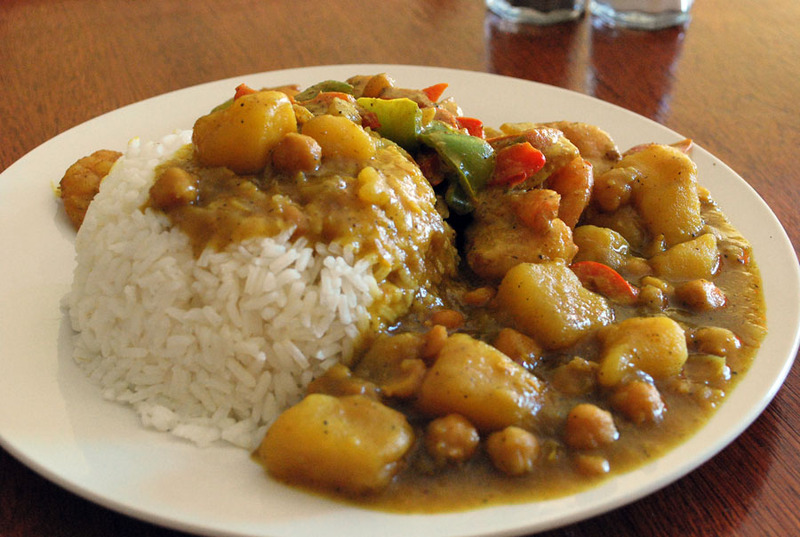 It’s an ideal dish for both Caribbean food newcomers and veterans. Other notable dishes on the menu are the finger foods: the patties which can come in beef, lamb, chicken and vegetarian, also Doubles which also contain curry and chickpeas. Also, try the mango hot sauce: it’s fiery and fruity but refreshes and cleanses-a great accompaniment to the curry dishes. Curry shrimp. Photo by Charles Snyder. Other traditional Caribbean food can also be found at Callaloo: fried plantains, red beans and rice, jerk chicken, jerk shrimp and stewed oxtails are all on the menu. Notable beverages include homemade ginger beer and a Trini staple, Mauby, which possesses a bitter sarsaparilla flavor. Aside from the amazing food at the restaurant, Callaloo offers Calypso Steel Drum performances (which originated in Trinidad-Tobago), also called steel pan music. There’s so much to explore at Callaloo and Latiff is more than happy to be a guide. Don’t be afraid to ask questions and try new things. Callaloo is sure to fulfill your Caribbean food cravings and an escape from the daily grind. 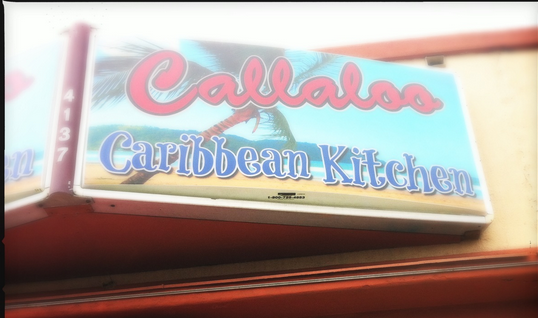 Callaloo Caribbean Kitchen is located at 4137 E. Anaheim St., (562) 230-7530. Like them on Facebook for food specials and entertainment updates.